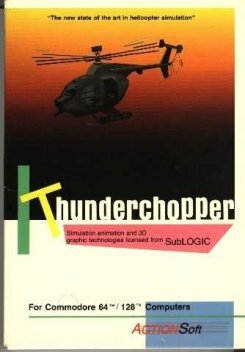 ThunderChopper was released in 1988 for the Commodore 64 and 128 and used the graphics engine developed by SubLogic for Flight Simulator 2. "Thunderchopper was available for the PC and Apple II. I've played both. Thunderchopper can actually load Flight Simulator scenery disks! It's also one of the first chopper sims that had rescue scenarios (well, maybe except Super Huey Helicopter Simulator.)"